Lloyd Marcus -- Should GOP Conservatives Adjust Their Message for Blacks? Dougherty wrote... “Conservatives in the GOP like to assail identity politics and tout their own ideology as one of color blindness. Sometimes this is stupidly marketed to black voters as a selling point for Republicans. "We don't categorize you by race," brags a Republican. The black audience hears: "We don't take the most salient part of your American political identity seriously." I am a real-live black person. When I hear Republicans say "We don't categorize you by race", I think, “Thank you for respecting my intelligence enough not to pander to me.” Dr Martin Luther King, Jr, a Republican, dreamed of a day when Americans would focus on principles such as character rather than skin-color (race). Civil rights leaders and Democrats have abandoned Dr King's vision of a colorblind America. Especially since Obama, the exploitation of race is the Democrats' super weapon to win every political battle. 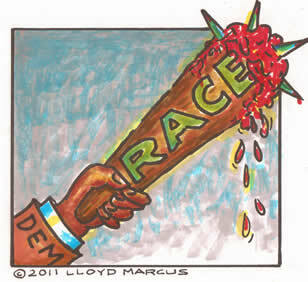 Anyone daring to oppose the black president's socialist/progressive agenda is bombarded with accusations of racism. Checkmate! Dougherty appears to suggest that we conservatives can not simply stand up for what is right and true. We must adjust our message to fit the Democrats' false accusations and false assumptions. For example. Dougherty thinks the GOP should back-off from their push for voter I-D laws because it looks like they are attempting to suppress the black vote. Mr. Dougherty, as a black conservative, I find the concept that blacks are too incompetent to find their way to acquire a photo I-D extremely insulting, demeaning and offensive. Democrats are fighting voter I-D because they seek to steal elections via voter fraud. Will Republicans waving the white flag on this issue win them black votes? I think not. Dougherty thinks America's history of racial injustice causes blacks to deal with the issue of race every day. I beg to differ. Neither myself nor my black family, friends and associates deal with racial issues every day. Despicably, liberals and Democrats strive to make race an issue, polarizing Americans; keeping the fires of racial tensions burning bright for political gain. I reject Mr Dougherty's call for conservatives to abandon colorblind politicking. Why must we always allow Democrats and their media buddies to determine the rules of engagement? We are all Americans and should be dealt with accordingly, rather than doing what the Democrats do; divide Americans into supposed victimized voting blocs and pandering to each group for political exploitation. In the 1980s, as a young black kid clueless about politics, Ronald Reagan's one-size-fits-all conservative message of American exceptional-ism spoke to me. Reagan inspired me to be all I could be. His speeches made me feel good about myself and my country. Admittedly, Conservatism will not resonate with everyone. Some people are born leeches and lazy; always looking for a free ride. These types feel entitled to the fruits of other folk's labors. Democrats love to pander to them. But I believe in the character and goodness of a majority of the American people. When presented unfiltered by liberals, conservatism will find a lot of Americans eager to embrace it. Why? Because Conservatism is in-sync with the human spirit. Please understand. Packaging the conservative message to appeal to various audiences is an excellent idea. However, watering down our principles or choosing not to challenge the Democrats' false narratives is foolish and wrong. Certain principles have a universal appeal. Such principles bridge racial divides. In the 1970s, I was a student at the Maryland Institute College of Art. My fellow black students at the mostly white college were extremely militant and anti-whitey. A group of them demanded that the Black Panthers be allowed to rally on campus. I was stunned when these same black students approached me extremely excited about this awesome movie, “Rocky”, the Italian stallion. It was remarkable to witness these particular black students so passionately embracing a white boy. The magic ingredient was the “colorblind” principles espoused in that movie which spoke to the humanity in us all. Mr Dougherty, I respectfully disagree with your article. As an American who happens to be black, I do not desire a “black version” of Conservatism which is rooted in true compassion and common sense.